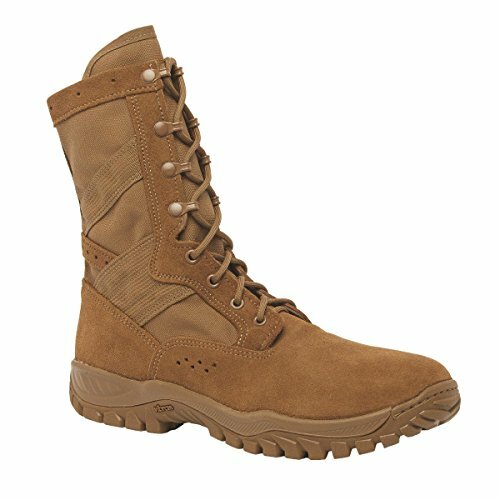 If you use rucking for personal physical fitness or for military training, you need good boots. Footwear is hands down the most important piece of equipment for rucking (after that your rucksack is second most important). Let’s talk about what makes the best boots for rucking in 2019. 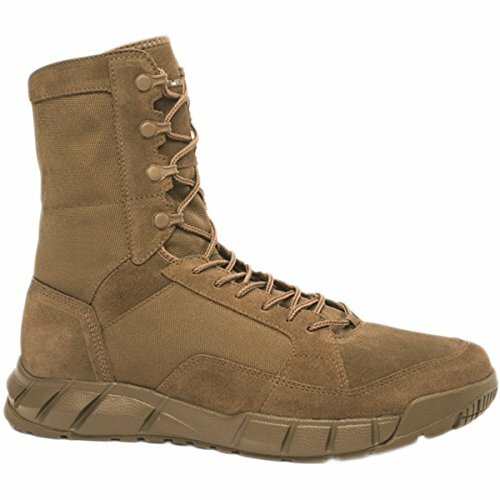 First of all, if you are in the US military your footwear might have to be AR 670-1 compliant boots. That’s the US Army regulation that dictates what footwear (and other items) are allowed as part of the uniform. Boot must be 8″ to 10″ high. Must be made from tan or coyote color cattle hide leather (flesh side out). Plain toe, not steel toe. Color matching sole – The sole of the boot must also be tan or coyote. Sole can’t be more than 2″ in height. The outsole must be rubber or pure polyether polyurethane. Boot upper has to be leather or non-mesh fabric. If it doesn’t look a lot like the Army issue combat boot, it’s probably not gonna be compliant. OK, with that out of the way, what else do we look for? Rucking can involve water immersion – of your feet, or your whole body. And this means boots full of water. What’s worse than boots full of water? Boots full of water for 2 hours. Generally speaking, you probably want boots that drain water, as opposed to waterproof boots. Waterproof boots and boots made from Gore-Tex tend to keep water in just as effectively as they keep water out. And while Gore-Tex is supposed to allow water vapor out for for foot comfort and breathability – it’s not good at dealing with amounts of water in excess of regular perspiration. So, we need boots that have a reasonable chance of draining water quickly. Beyond that, the weather and terrain you will be dealing with will matter most. 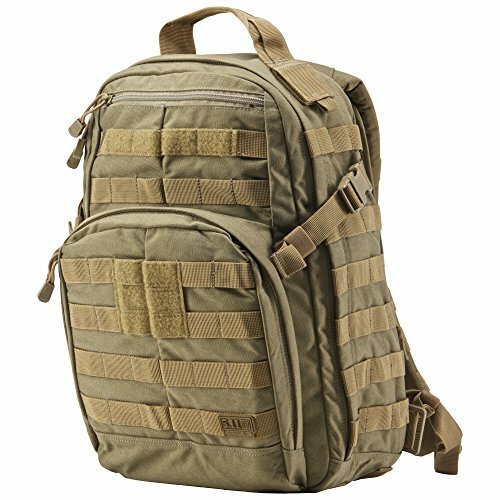 Rucking can be hiking in rough terrain, or urban areas, or both. And don’t forget accidental or purposeful water immersion (creeks, rivers, beaches, ponds, etc.). 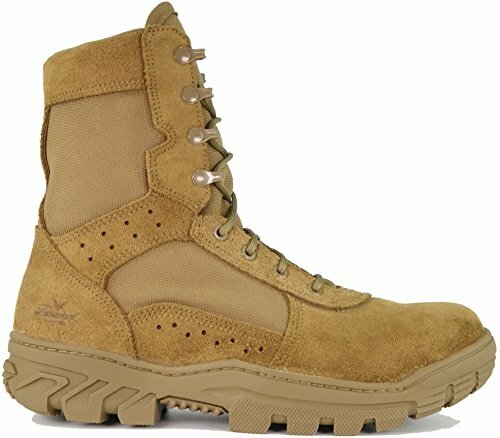 Let’s look at AR 670-1 compliant boot options first. 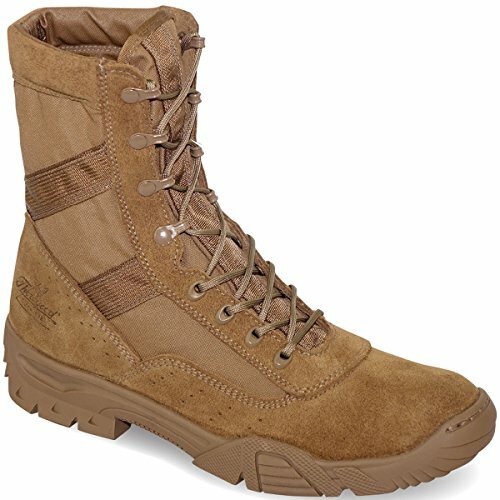 The Garmont T8 NFS Tactical Boot (Buy on Amazon) is one of our top picks for rucking. First of all, it is a AR 670-1 compliant boot – They are described as suede – which means the flesh side of the leather faces out. They are coyote color, with matching sole. And the outsole is rubber. You can also see they are tall enough to meet the 8″-10″ height requirement. This is the NFS version of the T8 boot – so it’s extra light-weight. This version of the T8 boot has Gore-Tex – so remember our comments on water drainage. Gore-Tex helps keep your feet dry – but can hold water in after water immersion. According to the manufacturer, these weigh 660 grams. 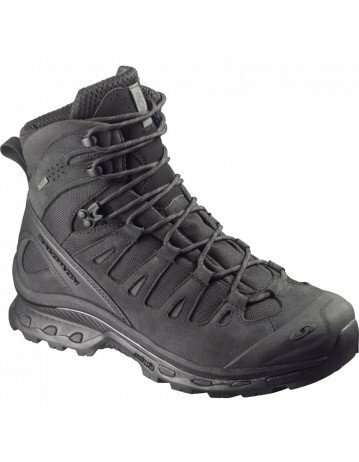 The Garmont T8 Bifida Tactical Boot (Buy on Amazon) is a version of the T8 boot without Gore-Tex. AR 670-1 compliant, and otherwise very similar. Why is this called the “Bifida” version? The rubber outsole is the Vibram Bifida design – made from materials and structured to provide excellent grip and traction in a variety of circumstances. The upper is made from suede leather and 600D Nylon. Available in Desert Sand or Coyote colors. 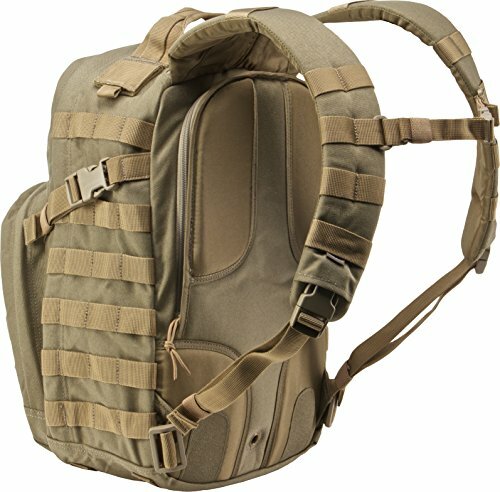 Coyote should be your choice to satisfy the “tan” color requirement. Having no Gore-Tex these can subject your feet to moisture from tall grass, morning dew, etc. But they will drain water better as a result. And they are nicely ventilated and quick-drying. These are also light-weight at only 540 grams. Let’s look at more AR 670-1 boots. 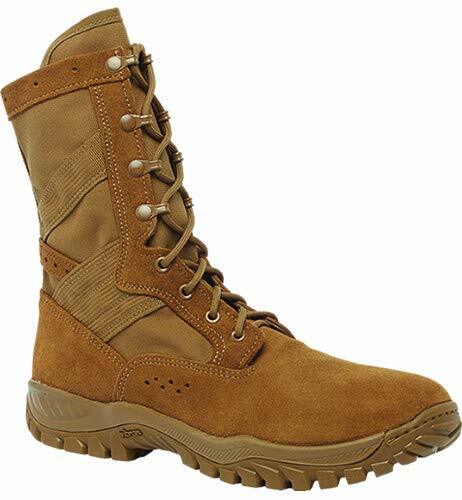 The Thorogood Men's War Fighter Military Non-Safety Toe Boot (Buy on Amazon) is another good choice. In Coyote color and made from rough out leather and 1000D Cordura with a rubber outsole they are AR 670-1 Compliant. These come with streamlined paracord laces – some people prefer these to the wider laces that come with the Garmont boots. Of course changing the laces is easy – so go with either boot that you prefer. There are also available in a Safety Toe Version (Buy on Amazon) boot, if you are allowed to wear that item. 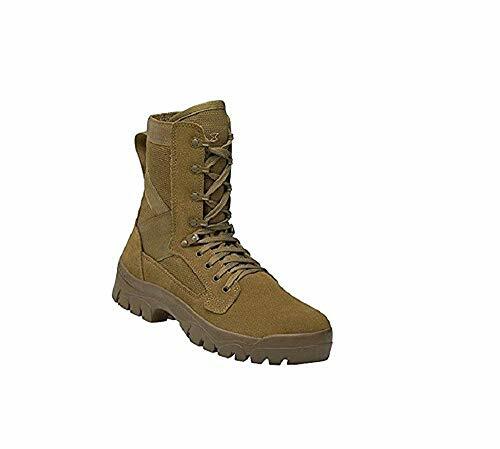 Thorogood also has a more economical model – the Men's Saw 8 inch Military Boots (Buy on Amazon) boot. Also AR 670-1 Compliant, but cheaper. People also like the Oakley Mens Light Assault Boot (Buy on Amazon). It is AR 670-1 compliant, so it looks the part. These are very light-weight – and comfortable. Some users note that you can feel wind through the cordura – that’s a plus if you are in hot weather – and a downside other wise. These are definitely a light-weight “speed” boot – not a winter boot. Here’s one more light-weight boot option. 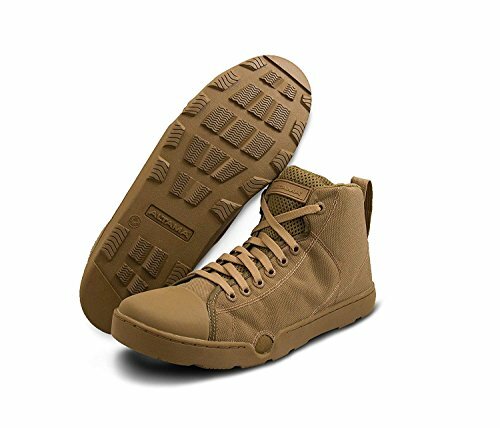 The Belleville One Xero C320 Coyote Brown Ultra Light Assault Boot (Buy on Amazon) is made in the USA. They are very lightweight – and last a long time. Need laces that won’t break? You need Rhino Laces (Buy on Amazon). 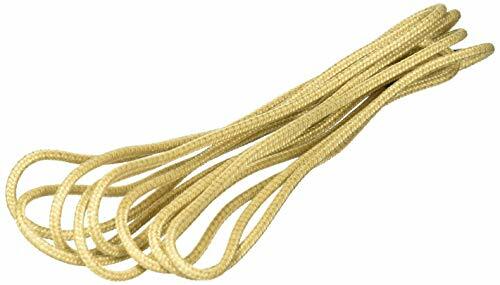 Created by wildland fire fighters these are guaranteed to be unbreakable, fire proof and cut proof shoelaces. Not only are they tough – but they have solid metal lace tips, and come in a variety of colors, including Coyote. These are especially good for boots with eyelets that are tough on laces. 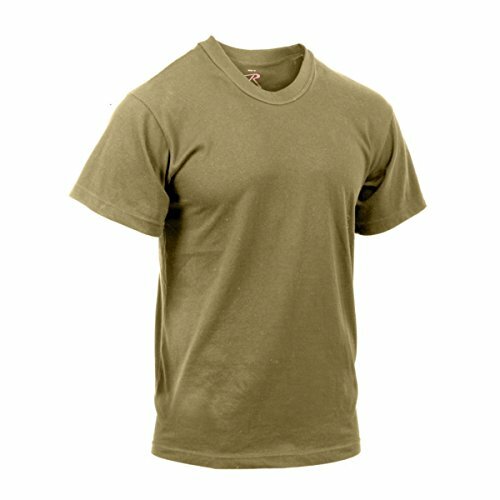 One more thing, need AR 670-1 compliant coyote brown shirts? Matches Pantone color 699 and made to Army regulations. Beware of shirts that are too short. Some of them on Amazon are made for those with a short stature. OK, so now we’ve looked at quite a few Army Regulation 670-1 compliant boots. But, what if you don’t need that? Here’s some more options for you. We couldn’t complete this article without mentioning the worlds first purpose designed ruck boot – the GORUCK MACV-1. 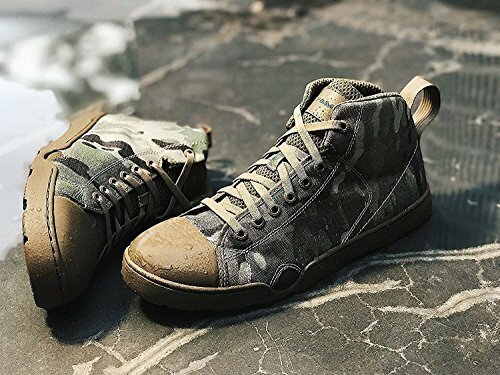 The GORUCK MACV-1 is technically a jungle ruck boot. Modeled after Vietnam war era Special Forces jungle boots, but it goes much farther. First, it’s made for extreme comfort. It has a premium suede heel counter – and GORUCK goes so far as to claim that no break-in period is needed. A wide toe box and a lightweight EVA midsole help as well. Secondly, The MACV-1 drains very well, thanks for drain holes built into the boot. Thirdly, it’s super light-weight. It weighs a mere fraction of other rucking boots – a pair weighs in at only 14 ounces. That is feather light in the world of boots. It’s also made to be versatile – some have called it the “ultimate every day black boot”. It doesn’t have a super aggressive tread – but it won’t look out of place in the workplace, board room, or on the hiking trail. And lastly, it’s pretty affordable. It is priced competitively with other hiking boots. Available in two colors – the original black or coyote tan, this is NOT an AR 670-1 compliant boot. But it’s a great option for those that can use this style of boot. 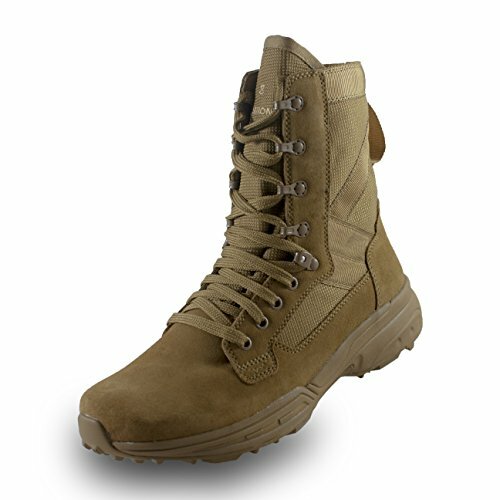 Let’s switch gears a bit and take a look at some of the hiking boots that do a good job for rucking. Salomon is a big name in hiking boots. Salomon has been designing and making hiking boots and other sporting equipment for over 50 years. 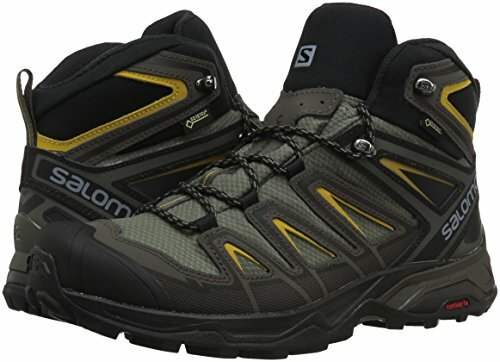 For a ruck boot the Salomon Men's X Ultra Mid 3 Aero Hiking Shoe (Buy on Amazon) is our first choice. Why? This is a rugged, comfortable boot, with tenacious grip. It’s not waterproof – and it doesn’t feature Gore-Tex. But, that’s OK. We want lighter weight, we want breathability, and we want water to drain, not held in our boots. It’s a mid-height boot. A higher boot better protects your ankle or calves, and helps keep debris out. But a higher boot also means more weight. You don’t need a high boot for the average ruck event, so the Mid models of Salomon boots specifically get our vote for rucking. This is a warm weather boot, and includes a 2 year limited warranty. Like the sound of that but want some level of water resistance? 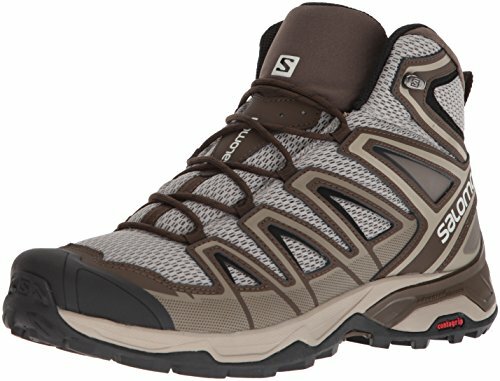 Go for the Salomon Men's X Ultra 3 Mid GTX Hiking Boot (Buy on Amazon) instead. 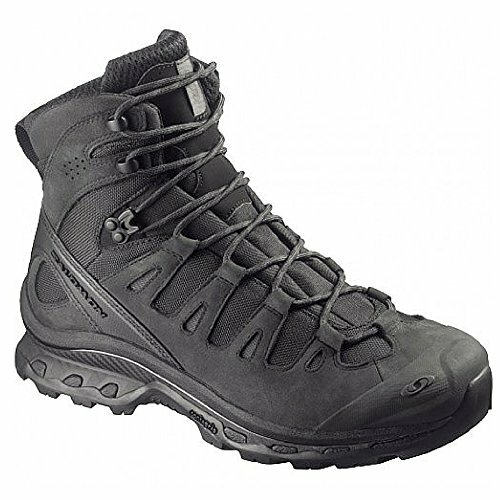 This has all the great features of the Ultra 3 Mid Aero model – but the GTX designation means it includes Gore-Tex. Gore-Tex is a waterproof, breathable fabric membrane. 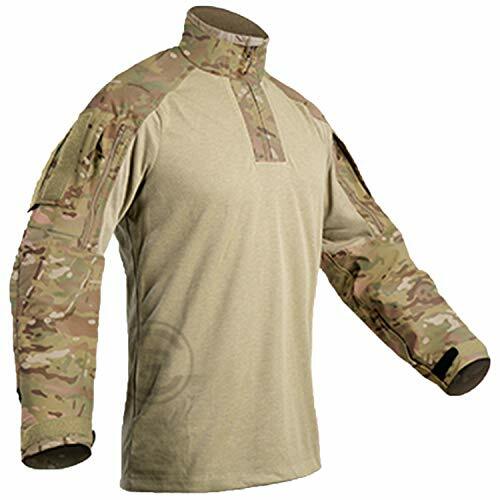 Gore-Tex is able to repel liquid water while allowing water vapor to pass through, and is designed to be a lightweight, waterproof fabric for all-weather use. These are excellent water-proof boots. Just remember if your feet become immersed, that water repellant nature of Gore-Tex works both ways. These aren’t going to drain well. 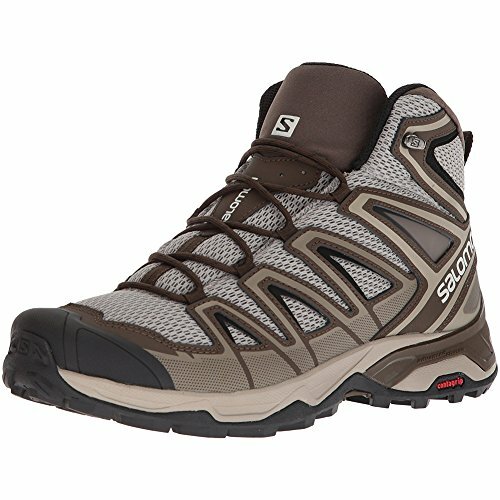 But having said that, these have all those great features you want from a Salomon hiking boot – and include that 2 year limited warranty as well. Lastly, we’d like to highlight one more pair of Salomon boots. 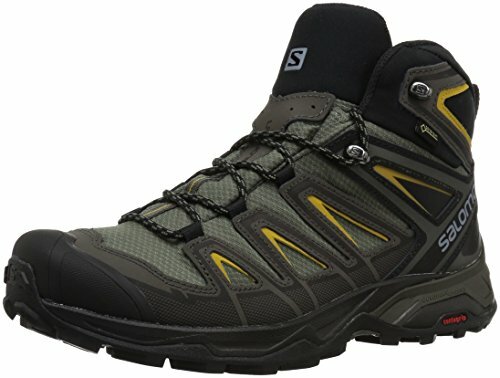 The Salomon Quest 4D GTX Forces (Buy on Amazon) is a great boot (waterproof via Gore-Tex). 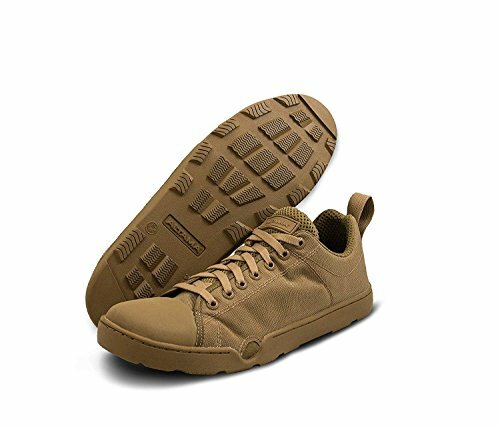 These are very popular with law enforcement and some military units, and get rave reviews for their comfort, function, and durability. The upper is made from leather. They are based on Salomon’s “4D” chassis which provides the ultimate stability, cushioning, ride, and secure grip. These are heavier than the Mid models we highlighted above, but they are still great boots. They weigh 655 grams (in comparison the Mid models above are about 450 grams). There are other variations of the Quest 4D boot, but this is the Forces variant that is meant to be a tactical combat boot. It features subdued colors and non-reflective markings, as one example. A non Gore-Tex variant is available as well, the Quest 4D Forces (non Gore-Tex) (Buy on Amazon). It’s a little bit cheaper than the GTX model, typically. Lastly, these boots are a popular choice for use by Navy Seals. And, speaking of operator boots, let’s look at one final option. The Altama OTB Maritime Assault Fin Friendly Mid Cut Operators Boots (Buy on Amazon) are made for maritime use. Dive fin friendly, waterproof insole, and mesh drain ports. These “boots” are purpose designed for immersion. The outsole is a super-grippy (even when wet) high traction rubber compound. How grippy? The rubber compound is based off that used in rock climbing shoes – but modified to work when wet. See those massive drain ports? These would be great boots for beach rucking, or rucking in the sand. The drainage will ensure you can purge any sand or mud from the shoe. These are also relatively light – compared to a true boot – so it’ll be easier to do flutter kicks and any other crazy stuff that the “Welcome Party” might require. And they look like Converse Chuck Taylors. Some people even go so far as to call them “Tactical Chucks”. They look good, and work well – check the Amazon reviews. The good looks and wide choice of tactical and non-tactical colors mean they blend into any situation. They are also available in a low cut version (Buy on Amazon). In summary, there are a variety of factors for the best rucking boots. If you expect your feet to be submerged, you probably want a boot that drains well. If you expect to encounter only light moisture a Gore-Tex or waterproof boot may be in order. If you are in the military you may need boots that meet the AR-670-1 regulation – which is very specific.